Sporting one of the most recognized brand names in the cookware world, this 12 piece ensemble from T-fal has all your cooking needs covered. Whether you are reheating, boiling, making sauces, making huge servings, tossing food, frying, searing, or boiling eggs, this set will get the job done. Best of all, the pans in this set feature T-fal Thermo-spot technology. This is an indicator that lets you know when your pan is preheated at just the right temperature so you can be sure the flavors of your food will be sealed in. We have analyzed this cookware set based on the following review criteria: special features, its ability to deliver optimal value over the long term, versatility of use, how easy it is to use and overall handling, how easy it is to clean up, and durability. The T-fal C515SC set comes with 12 pieces. It includes saucepans, dutch oven, fry pans, one egg wonder, and a steamer. This all-in-one combination is very economical since you don’t have to buy specialized cookware separately regardless of what you’re planning on cooking. All units feature a Prometal Pro nonstick interior which is very resistant to scratches and can take quite a bit of punishment. The most interesting feature of the C515SC is its incorporation of an upgraded version of T-fal’s thermo-spot heat indicator technology. This improved version lets you know when the pan you’re using is preheated just right so you can be assured that the flavor of the food your cooking will be locked in. This feature solves a crucial problem-flavor. Instead of just relying on luck for flavorful food, having this great ability enables you to produce great tasting food consistently. You don’t have to rely on random chance to make your food come out right. The C515SC set delivers key pieces you need for the most likely kitchen operations: saucepans for sauce making, Dutch ovens for stocks and stews, fry pans for shallow frying, steaming, and preparing eggs. In short, you don’t have to worry about getting the right specialized cookware for whatever meal you are preparing. This saves you a tremendous amount of money compared to having to buy specialized pots and pans for certain kitchen jobs. The best part is you get everything with one price. There are no add on purchases. Another key factor that makes this set a solid long term value is the quality of its nonstick surface. 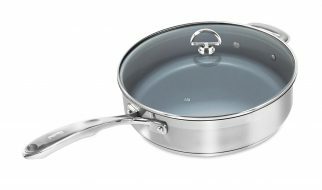 Thanks to Prometal Pro technology, this set’s nonstick surface is designed to last longer. It’s easy to see the versatility of this set. You only need to whip out the right specialized cookware for whatever you’re preparing. Need to prepare great eggs? Take out the one egg wonder. Do you have a huge casserole that requires hours of stewing? No problem, the Dutch oven in this set has you covered. You no longer are stuck with having to use one cookware to handle a wide range of different dishes. Besides versatility of use, the stainless steel construction of this set ensures it works well not only on induction cooktop surfaces but also on traditional electric and gas ranges. You can take it on the road and not have to worry about the availability of a certain type of cooktop. You can even safely use it in an oven set up to 400 degrees Fahrenheit. Not only are the handles for this ensemble easy to grip and cool to the touch, they are also quite ergonomically positioned-not too long and not too short. The handles don’t get hot no matter how long the cookware’s been on the stove or range. 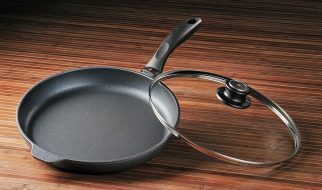 You can safely and quickly move pots and pans around without having to worry that you might slip up or tip the cookware and spill because you can’t hold the pan for too long without getting burned. This set’s Thermo Spot Heat Indicator feature is what truly takes this set’s ease of use to a whole other level. Instead of having to guess when you can place ingredients into the pan, the pan will tell you. How’s that for idiot-free use? Just pay attention to the thermal indicator so you can know the precise time you can put your meat on the pan to sear in all its tender juicy flavor. The same applies across the board to other types of ingredients. You know longer have to rely on hunches to maximize the flavor and texture of your food. Since this set’s non-stick coating is durable and can withstand quite a bit of long term beating, this set is very easy to clean. You just need to dip a sponge into some soapy water and use it to wipe down the surface and sides of the cookware in this set. You then run the cookware under some cold running water to fully rinse. Quick and simple. In the off chance food debris dries and sticks to the exterior of any of the cookware in this set, you only need to soak the complete set to soften any stubborn grease or hard to reach debris. You don’t have to let it soak forever. You just need to give the water enough time to soften the debris or stuck grease so you can wipe it down with a sponge. This set features a non-stick technology called Prometal Pro. This technology has made this set’s surface so scratch resistant that you can safely use metal utensils on this set without having to worry about damage. Best of all, the whole set is backed up by a limited lifetime warranty. 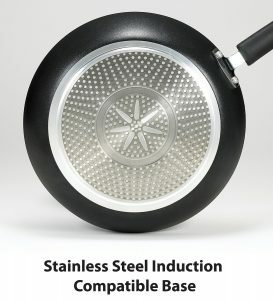 Check out our other Induction Cookware Reviews! Check out our Best Induction Cooktop Buying Guide for 2017 here! Read our full Induction Cooktop Reviews!